A recent installation of a Fibre Optic Pipeline Intrusion Detection System was applied to the 145 km extension of an underground natural gas pipeline to prevent potential damage and leaks through real time data monitoring. The world consumption of natural gas increases by an average of 1.7% each year for industrial uses, and 2.2% for the electrical power sectors. With this continual increase in demand comes the necessity for efficiency and reliability, as well as for efforts to minimise losses of gas occurring during the transmission and distribution processes. Gas pipeline leakage is a worldwide issue, with a report published in 2015 revealing an estimated 3.6 trillion ft3 of natural gas escaped into the world’s atmosphere from global gas and oil operations in that year alone. This wasted gas equates to roughly US$30 billion of lost revenue and about 3% of global natural gas production. These figures are not only substantial from a financial perspective, but also an environmental one, as methane emitted from leaking pipes contributes to the world’s growing global warming problem. Whilst the primary cause of gas pipeline leakages continues to be the ageing of pipeline infrastructure, the most significant leaks that occur are caused by damage from nearby excavation equipment. According to data published by the Pipeline and Hazardous Materials Safety Administration, out of 925 incidents which occurred in gas distribution pipeline networks between 2010 - 2018 in the USA alone, 270 were a result of excavation damage. Of this number, 85% were caused by third-party interference. To minimise damage to people, costs of repair, cost of renovation and lost revenue, pipeline monitoring is crucial. In the case of the Asian gas supplier, Guangdong Natural Gas Group (GDNGG), fibre optic sensing has proved to be a highly accurate, reliable and cost-effective tool, which can not only detect leaks with precise location identification, but also alarms personnel for events around the pipeline - proactively preventing the damage. 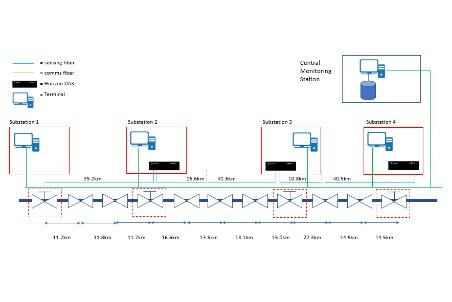 In order to protect a newly constructed 145 km extension of natural gas distribution pipeline from any potential damage, GDNGG recently commissioned Bandweaver – a global supplier of distributed optical sensing solutions – to supply a distributed acoustic sensing system to monitor surrounding third-party construction activity. This Pipeline Intrusion Detection System incorporates multiple Horizon DAS systems based at block valve stations along the pipeline. During the first two months of operation, the system raised 96 alarms, with a 90% verification rate by the patrol teams dispatched to investigate the cause. One of the alarms directly prevented damage to the pipeline when the Horizon DAS alerted personnel to mechanical excavation activity straight above the pipeline. The accurate data and prompt reaction prevented machinery from digging or boring to the level of the pipeline (a depth of 1.5m) and catastrophic damage was avoided. This operation fully conveyed how a Fibre Optic Pipeline Intrusion Detection System can benefit the gas and oil industry, principally thanks to the high-accuracy and reliability of the system. Preventing damage, and consequently leaks, before they occur not only saves companies thousands of dollars in man-hours and rectification efforts, but also protects human life, the environment and the reputation and legal integrity of the companies who employ its use.